You love your home. However, you have noticed a serious problem lately—a lack of space. When you bring work home, you’d much prefer to work in a dedicated office, rather than a corner of your family room. Your kids’ closets may have worked fine when the clothes only had to fit a 5-year-old, but now that your children are 15 and 17—it just doesn’t work. So, what does that mean for you and your home? You don’t necessarily want to move, you love the home you have right now and you don’t want the additional stress of planning a move. Perhaps renovation is the better option. There are many different ways to create additional space including both smaller and larger changes: closet makeovers, basement finishing or opening up the kitchen to a new family room. There are options. Can you transform part of your family room or guest room into a home office? Bring your dream room to life – have you been dreaming about a mudroom with dedicated space for backpacks, sporting equipment and instruments not to mention, shoes, boots, cleats, hats gloves…you get the idea. How about a separate laundry room with room to sort, store and fold everything. Maybe a craft room is more important to you? A design team can help bring your dream room to life, while adding in more space for everyone to enjoy. 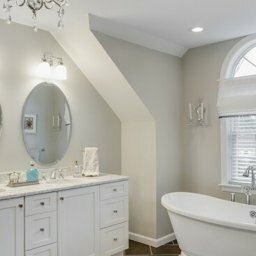 Renovating can be the most cost-effective option. You avoid sales commissions, mortgage and attorney fees, moving and other costs. Those savings can be applied to creating the home you want, right where you are. Instead of worrying about a move, you can plan a renovation. While it is still an investment of time and money – the benefits of staying in your home and upgrading it all at once, often makes it the right choice.